A sheer, unalloyed delight, Shazam! brings to life what most of us think of when we think of a comic book movie. It's silly, disposable, and aimed at children of a certain age. To be specific: 14, the age of protagonist Billy Batson. He's a plucky young man who keeps running away from his foster families, ostensibly in search of his birth mother, from whom he was separated at an early age. His latest placement finds him in Philadelphia among a loving, diverse family with five other children in the household. We, the audience, know that Billy Batson has great things in store for him, because the opening sequences set up the premise nicely. Director David F. Sandberg first came to public attention via his clever short film Lights Out (2016), which led to a feature version, written by Eric Heisserer, that expanded the premise nicely. "Good, clever fun that doesn't overstay its welcome," as I wrote in my review. "Lights Out exemplifies what a modest horror movie should be. It introduces a few characters, fleshes them out as much as needed, and then creates a series of unsettling scenes that are enjoyable to watch." Sandberg moved into the world of studio horror with Annabelle: Creation (2017), which I still haven't seen because I've apparently aged out of the 'killer doll' horror subgenre. Asher Angel's winning performance as Billy is almost entirely convincing. Like nearly all actors his age, he can't quite nail both the dramatic and the comic material, but he definitely elicits laughs from his body language and dialogue delivery, and makes his character sufficiently empathetic that it's easy to care about his plight, especially when he's surrounded by an endearing group of fellow orphans in a cheery family home, led by the supremely kind and patient parental units Victor (Cooper Andrews) and Rosa (Marta Milans). His primary ally is Freddy (Jack Dylan Grazer), who may be disabled, but never allows that to affect his sense of humor and generally cheerful disposition. This is good, because young Billy will need his help, once he is gifted with the ability to transform into an adult, super-powered version of himself (embodied by the witty and most capable Zachary Levi). As always in superhero movies, it's not enough to construct a heroic protagonist, since he/she always needs to face off against a villainous foe, and in Mark Strong, playing the evil Dr. Silvana, Shazam! is gifted with a terrific bad guy. Somehow, Strong makes all his powers look cool, to the point of envy (which ties back into the storyline, but I'll stop there). 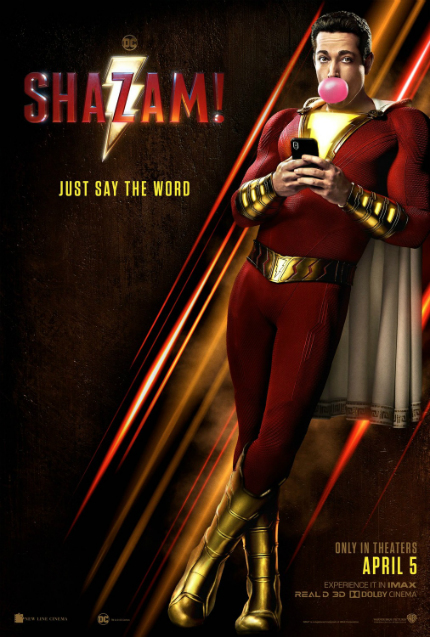 Though the film ultimately stumbles into the trap of extending action sequences far beyond their useful purpose, Shazam! flies on the basis of Henry Gayden's screenplay, based on a story credited to himself and Darren Lemke, which is itself inspired by the DC Comics character created by Bill Parker and C.C. Beck. Sandberg's direction always makes room for a punchline or two, which keeps the adventure light and the dangers fleeting. This is a comic-book movie intended for young adults, yet it never condescends to its audience. It really, truly, believes, and that helps make it a thoroughly engaging and enjoyable picture. The film will open in theaters throughout the galaxy on Friday, April 5, 2019.